INDIANAPOLIS (AP) Suddenly, the Washington Wizards look unbeatable. Their early season shooting woes are gone, they’re sharing the ball more and they’re playing like a contender. And they’ve done it all with All-Star guard John Wall on the mend. They did it again Monday as Bradley Beal, their other All-Star, scored 21 points and Kelly Oubre Jr. added 15 to lead the Wizards past the Indiana Pacers, 111-102 for a season-best fifth straight win. Since Wall went down with an injured left knee, Washington hasn’t lost. The latest victory gave the Wizards their fourth in a row over the Pacers, something that hadn’t happened since a nine-game winning streak in the series ended in 1983-84. The difference appears to be more balance. On Monday, eight players scored in double figures and three had at least seven rebounds. Thomas Satoransky and Tim Frazier each finished with six assists and Beal was the only Washington player with more than two turnovers. The Wizards outscored Indiana 30-11 in transition and had a 43-35 rebounding edge, too. ”I thought everybody chipped in and played well,” Washington coach Scott Brooks said. But the Pacers weren’t themselves. With All-Star guard Victor Oladipo out with an illness and point guard Darren Collison out with a bad left knee, the Pacers were out of sync and out of contention for most of the game. Indiana missed its first six shots, which allowed Washington to jump out to a 17-8 lead. The Wizards took complete control with a 13-0 run that made it 55-39 with 3:13 to go in the first half. The Pacers never got closer than seven again. Bojan Bogdanovic scored a season-high 29 points for the Pacers as he tried to spur a fourth-quarter rally. Joe Young added 17 as Indiana’s six-game home winning streak ended. Wizards: Markieff Morris had 11 points and 10 rebounds while Otto Porter Jr. scored 13 points. … Ian Mahinmi finished with 12 points and seven rebounds against his former team. … Washington shot 55.6 percent from the field. … The Wizards have won four of the last six played in Indianapolis. … Washington has had at least 25 assists in six consecutive games. 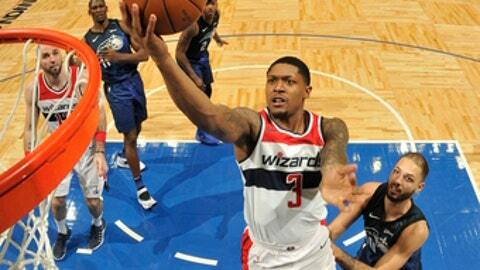 … Beal was 1 of 4 on 3-pointers, giving him 2,002 attempts in his career. Pacers: Domantas Sabonis finished with 15 points and seven rebounds. … Young made a career-best five 3s. … Lance Stephenson had 13 points, nine rebounds, six assists and six turnovers. Joseph had seven points and four assists. … Indiana was 12 of 29 on 3s but shot 46.2 percent overall, ending its four-game run of topping 50 percent. … The Pacers also were 16 of 25 from the free-throw line. Before the game, the Pacers announced Collison would miss two to three weeks after having arthroscopic surgery on his knee. Pacers coach Nate McMillan said Collison was injured during Saturday night’s win over Philadelphia. He’s hoping Collison, who was averaging 12.8 points and 5.3 assists, can return shortly after the All-Star break. McMillan plugged Cory Joseph and Stephenson but may change it up until Collison returns. ”I like Cory and Lance coming off the bench, so once Vic is back we’ll look at each game we’re playing and make a decision,” McMillan said. Wizards: Finish a three-game road trip Tuesday at Philadelphia. Pacers: Will try to earn a split in the season series Wednesday at New Orleans.